← July Post 1 – Change and transformation makes us beautiful. 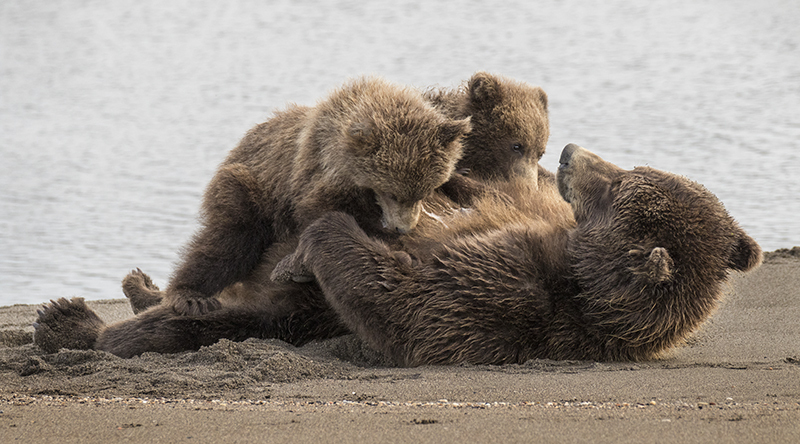 With a handful of other photographers, I stood on the banks of the Silver Salmon River at Lake Clark National Park in Alaska, tracking a grizzly sow and her two cubs through my camera’s viewfinder. The cubs, with relentless, whining cries that were almost symphonic, were telling their mother that they were hungry. Finally, mom gave in and lay down in the sand to nurse them. The whining turned to contented slurping grunts accompanied by “purring” which is nothing short of a constant loud motor like sound. The whole time she was nursing, the sow was listening and watching the movements in the river. When a Silver Salmon flashed in the current, her eyes followed its path. Suddenly she rolled the cubs off her, milk still squirting from her like geysers, and jumped into the shallow river. Darting back and forth, splashing water as high as her head, she dove in and out of the river. Most often she resurfaced without a fish, so she repeated the ritual many times until she either tired, the fish ended up in deeper water or she scored. It was quite a show of power and determination, and it seemed as though she actually enjoyed the chase. Grizzly bears (part of the brown bear family) are known for their fishing abilities, especially in Alaska. Bear medicine is a powerful totem for creating abundance and bountiful provisions. The bear cub symbolizes being fiercely loved and protected. Knowing this gives the cubs confidence, tremendous courage and carefree playfulness. 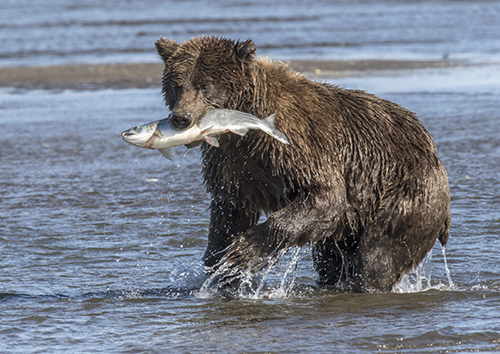 Before the fish arrive in this location the bears munch on sedge (marsh grass), nibble berries and dig up razor clams in the mud flats exposed by low tides, seemingly expending a lot of energy for a few bites. Every action of the sow is a lesson for the cubs. During these times the male bruins stay away, and with good reason: mothers are fierce. I am convinced that my personal life-guiding totem animal is the bear. In addition to being drawn to photograph them, I often feel like taking up residence in their fur. The grizzly sows show me the divine attributes that protect, nurture and empower. These are also the attributes I believe should be most prominent in a caring social fabric. Policies like DACA (Deferred Action for Childhood Arrivals) support young people who are Making America Great! To rescind it and leave 800,000 young people, most of whom are in college or established jobs, in a chaotic fear of an uncertain future or deportation is contrary to the spirit and wisdom of bear! Native beliefs explain that a totem animal is one that is with you for life, both in the physical and spiritual world. Though we receive lessons and directions from many different animal guides throughout out our lifetime, specific totem animals will remain our main guardian spirits. I am grateful that the bear is the central symbol on the California flag, and I pray for success as our government officials challenge the rescinding of DACA and the too many other mean and destructive actions coming from our “WHITE” House! 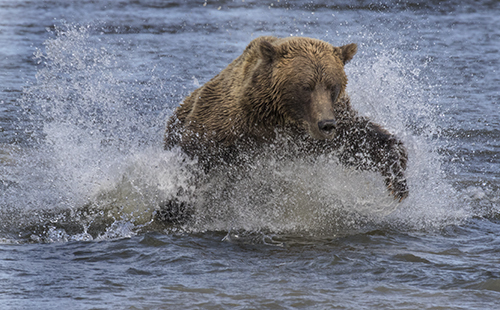 My bear images were captured in Lake Clark National Park at Silver Salmon Creek Lodge owned and operated by David and Joanne Coray. 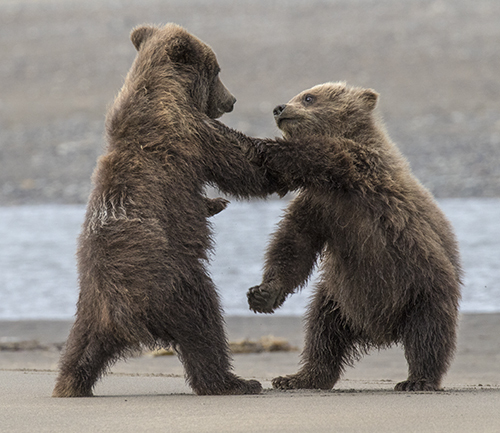 I spent 5 days on a Bear Photography expedition led by Photographer Brenda Tharp. Her instructional tours and workshops are the perfect combination of inspiration, photo opportunities, fun and in-depth learning. 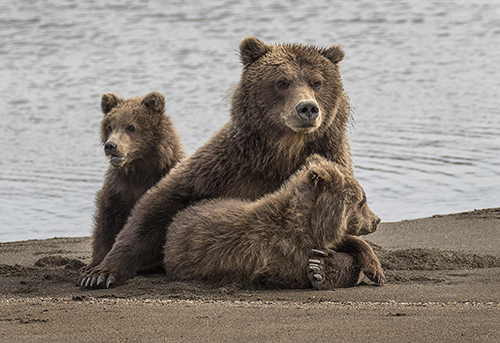 This entry was posted in Weekly 2 and tagged Alaska, Bear Cubs, Bear Photography, Bear Totem, Bear wisdom, Brenda Tharp, Brenda Tharp Photography, Brown Bears, Grizzly Bears, Lake Clark National Park, Silver Salmon River, Stacy Boorn. Bookmark the permalink.